Jesus said to his disciples, “Go and make disciples.” As Catholic Christians, one of the most important responsibilities we share is passing on our cherished faith to our children. At Saint Raphael School we are committed to providing full-time Catholic education for our families. 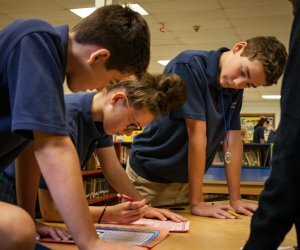 At Saint Raphael School we are passionate in our commitment to academic excellence, the social and physical development of our students and most importantly, instilling a strong spiritual formation of Jesus Christ and his Church. In the 60+ year history of Saint Raphael School, scores of families have been blessed to send their children to our school. We see in our families and our alumni the fruit of our mission that makes Saint Raphael School a true success story. We are very proud of our history and our accomplishments. The Saint Raphael Archangel Fund helps to bridge the gap between tuition and the actual cost of educating students. The Fund receives donations from our alumni, parents, grandparents, friends, students, faculty and staff. The Saint Raphael Archangel Fund enables us to offer financial assistance to families.